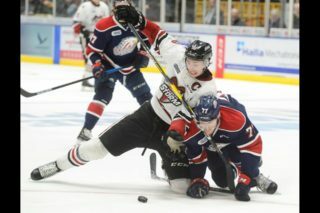 Heading into Thursday’s match-up, the Guelph Storm and the Windsor Spitfires were just four points removed in the Western Conference standings. With the West already a log-jam, with just six points separating fourth place from eighth place, the Storm visited the Spitfires looking to — and successfully — building on their lead with a big 4-3 win. Nate Schnarr led the way offensively, registering one goal and two assists for first star honours, while Liam Hawel wasn’t too far behind with two points (one goal, one assist) in the victory. Rookie Tag Bertuzzi also recorded his OHL career’s first multi-point night with two assists. Between the pipes, Anthony Popovich got the nod, turning aside 27 of 30 attempts, while the Spitfires’ Michael DiPietro made 21 saves in the loss. The Spitfires opened the scoring at the 13:05 mark of the first with Luke Boka’s 12th of the season, only to have the Storm come back with three straight tallies starting with Hawel’s quick response 33 seconds later. Bertuzzi put the puck on net, only to have the Dallas Stars prospect display impressive hand-eye coordination to tap the puck past DiPietro out of mid-air, tying the game at one-a-piece. 3:59 later, Schnarr put the visiting Storm ahead on the power play, pouncing on a rebound in front for his 13th of the season. 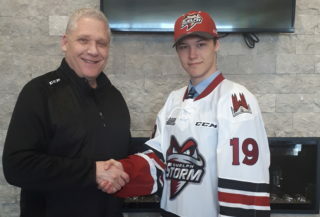 Moving into the middle frame, James McEwan – who was filling in on defense with Ryan Merkley serving his first of a three game suspension – extended the Storm’s lead to two 5:56 into the period. 20 seconds later though, the Spitfires made things interesting, getting one back thanks to Chris Playfair. Later in the period, the Spitfires completed the comeback as Jake Smith registered his 14th of the season off a point shot to tie the game up at three. In the final frame, the Storm came out firing, outshooting the Spitfires 10-3, and eventually taking back the lead with under five minutes remaining as Alexey Toropchenko was sprung on a breakaway, using the shaft of his stick to stop a bouncing puck to quickly fire it past DiPietro for the game winner. 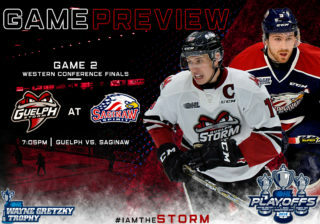 The Storm look to make it three-in-a-row on Friday night, returning home to host the Saginaw Spirit for a 7:30pm puck drop. 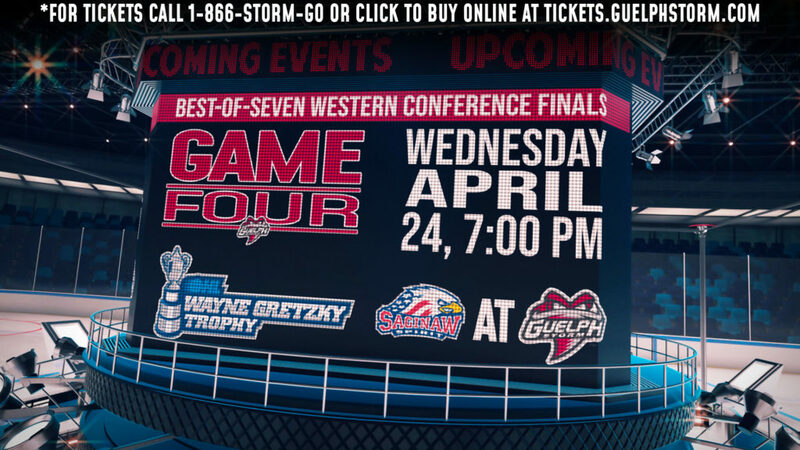 Purchase your tickets online here, by calling (519) 837-9690, or in person at the Storm Box Office in Old Quebec Street Mall. 1st Period-1, Windsor, Boka 12 (Corcoran, Angle), 13:05. 2, Guelph, Hawel 9 (Bertuzzi, Schnarr), 13:38. 3, Guelph, Schnarr 13 (Hawel, Lalonde), 17:37 (PP). Penalties-Hawel Gue (slashing), 8:42; Schiemenz Wsr (hooking), 16:01; Starikov Wsr (hooking), 19:58. 2nd Period–4, Guelph, McEwan 11 (Bertuzzi, Schnarr), 5:56. 5, Windsor, Playfair 5 (Kutkevicius, Stevenson), 6:16. 6, Windsor, Smith 15 (D’Amico, Morgan), 14:10. Penalties-Woolley Gue (hooking), 9:17; Bertuzzi Gue (hooking), 15:55. 3rd Period–7, Guelph, Toropchenko 10 16:07. Penalties-Shankar Wsr (cross checking), 10:44. Shots on Goal–Guelph 8-7-10-25. Windsor 13-14-3-30. Power Play Opportunities–Guelph 1 / 2; Windsor 0 / 3. Goalies–Guelph, Popovich 25-16-1-2 (30 shots-27 saves). Windsor, DiPietro 21-17-1-1 (25 shots-21 saves). Referees-Ryan Harrison (3), Quincy Evans (7). Linesmen-Mitch Dunning (72), Geoff Rutherford (62).